CLOUD computing is meant to provide flexibility, reliability and scalability, helping a company to save money on its IT infrastructure and services. Keeping this in mind , it also makes sense to save money on the software licenses being used. Considering the above points , it makes more sense to buy the best in terms of quality of service, cost of the service & top providers in that domain. This is analogous to the fact of buying a branded personal computer or an assembled one, both have their pros and cons. A change in IT procurement has begun with the availability of online catalog of cloud-based services. Cloud App Store is an initiative of UK government in association with G-Cloud. CloudStore (beta) is an online catalog with more than 1700 apps from 255 suppliers available for buying by the UK public sector. Its a central repository where companies can compare an app from different providers and make a smart decision before moving to that cloud service. CloudStore provides an "Ala Carte" option for consumers - select a service as per the needs. 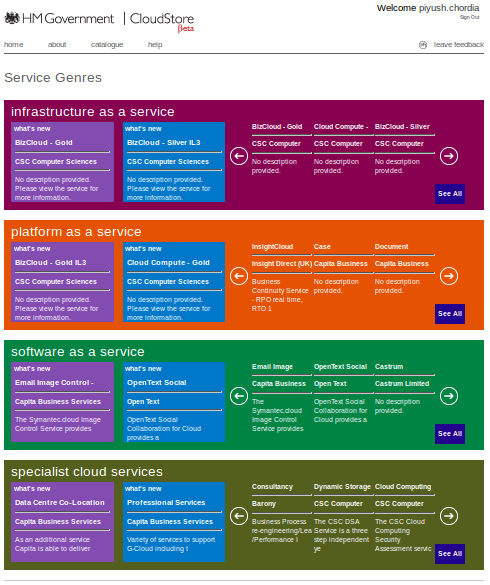 Cloud Services available through the online catalog include: Infrastructure as a service (IaaS) , Platform as a service (PaaS) ,Software as a service (SaaS) and Specialist services such as configuration, management and monitoring.Using CloudStore is very simple because of its domain based classification. Some of the suppliers listed include : Big providers like Atos, British Telecommunications, Capita, Bramble.cc as well as Google Ireland Ltd (Google Apps for Business, Google Docs etc...) ,Microsoft Ireland (Azure cloud storage system) and IBM (Cloud security, workload analysis, network infrastructure optimization etc) to some small service-based sellers like Computacenter, Trustmarque,Kelway. CloudStore is hosted on Microsoft Azure.Every application or service you select on CloudStore , provides you with details like provider contact, license terms , services provided, pricing model and many other such details. You can also view some other services from the same provider. CloudStore is the first app store of its kind in the UK for public sector ICT (Information and Communication Technology) procurement. The success of the store is growing rapidly, and more providers will join the success story. What's missing on the store is rating of the provider and its services. 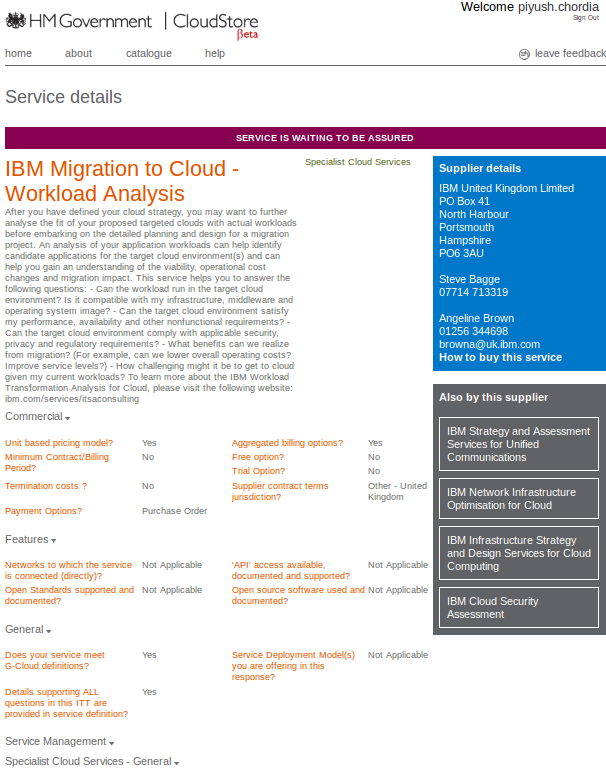 But as said, its evolving and customers will soon start rating a particular cloud service. CloudStore will surely drive much faster adoption of cloud services, and provide deeper insights for CIOs & SMEs, creating a more competitive market in the CLOUD domain.